Box has begun rolling out Notes, the lightweight note-taking application it announced in September, making its first foray into content creation and office productivity tools. Box’s core product is its cloud storage and file sharing service, but the company doesn’t want to be isolated as a one-trick pony. It has encouraged other software companies to link their products to its service and worked to improve how customers can view and manage their files and documents. The Notes tool is a more speculative initiative. It’s not clear how much demand there will be for it, given the abundance of word-processing and note-taking applications out there, including Microsoft’s Word and OneNote, Google’s Docs and Keep, and tools from specialists like Evernote and Quip. Notes has a word-processor-like interface where the document creator and colleagues can add content and co-edit in real time. Box developed Notes because it felt customers could benefit from a native tool within the service for capturing and sharing information on the fly in an ad hoc manner. That way, they wouldn’t have to toggle to an external app. 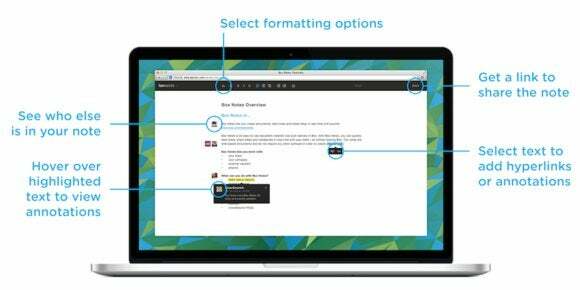 When Box first announced Notes, it said users would be able to embed rich media content in documents and do offline editing, and that the product would keep a version history, with the ability to revert to earlier drafts of a document. A Box spokesman said Thursday that version history is “coming soon” and offline editing and rich content features are being considered. In addition to basic editing features, users can add hyperlinks as a way of inserting images in a document, he said. Executives said in September that Box would likely develop more content creation and office productivity applications. A big competitive shift since then is Microsoft’s launch of native Office apps for the iPad, and soon for Android and Windows 8 tablets. Microsoft has also beefed up Office Online, the free browser-based version of the suite. In the announcement Thursday, Box official Jonathan Berger detailed a number of ways in which the company has been using Notes. “For instance, our engineering leads collaborate in Box Notes to create and then share their weekly updates with entire engineering organization. Our CEO now sends company-wide notices in Box Notes. We create marketing plans, draft press releases, develop FAQs, take meeting notes and more—all in Box Notes,” he wrote. So, according to Box, the uses for Notes go beyond creating documents and taking notes and include lightweight project planning, group task management and individual to-do lists. Given that vision, it’s conceivable that Box will add features in later iterations that make Notes more useful and powerful for these different scenarios. Box will roll out Notes progressively to all of its customers in the coming weeks. It will be available via the main desktop browser interface and via the service’s mobile apps.